As a medium-sized company among the greats it is important to always have a good nose for the right market niches and thereby impress with a proven tradition with products of excellent quality. With this motto, all four generations of the Pöschl family business with their highly motivated employees have shaped the business as a result of their skills and creativity, reacted to developments and trends of the consumers and thereby achieved great successes on the national and international tobacco market. In Landshut, at the turn of the century, the young Alois Pöschl learns the profession of businessman. By bicycle, Alois Pöschl is on the road as a salesman all around Bavaria, delivering haberdashery and snuff. On December 24, 1902 he finally implements his business idea of selling snuff despite having only small financial resources available. 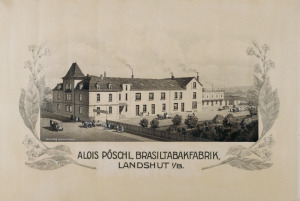 Together with his companion Max Ebenherr, who retired from the company again soon after, he founds "Brasiltabakfabrik A. Pöschl & Cie." With the few devices available at the beginning, Pöschl focuses on the production and sale of "Schmalzler" snuff. Only through perseverance, hard work and pursuing the best possible product quality can the small business successfully prevail against the overwhelming competition of the established Schmalzler factories in Landshut. Even then, the still valid principle of "It is quality if the customer comes back and the product does not" was of major significance. After the production losses caused by World War 1 are overcome, Alois Pöschl develops a trademark for product differentiation of the Pöschl-Schmalzler around 1920 in order to stand out from the products of other manufacturers. Henceforth, the Pöschl origin of the product is to be made recognisable on the packaging of the brand-name product for the customer with a "P" in the octagon. Similarly, grocer's shops in Bavaria which sell the snuff get red enamel signs on which the Pöschl product is promoted. Neither inflation nor the currency reform of 1923 takes away the entrepreneurial spirit of Alois Pöschl. He even dares an extension of the product range in order to include the "Schneeling", a tobacco-free snuff, and a Schmalzler with natural fruit flavours, which has been popular under the brand name "Doppelaroma" up to today. In order to increase sales, he also hires five commercial travellers, who initially – like the founder of the company himself – sell the snuff products by bicycle and later by car. This sales strategy gives the family business significant revenue increases and induces Pöschl to expand their production facilities. 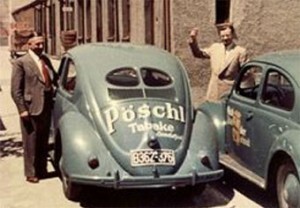 The two sons Wilhelm and Alois Pöschl junior join the company in 1935. Together with their parents, they are able to save the company, which is converted into a general partnership from 1936 on, from collapse during the chaos and horrors of the Second World War. After the end of the war in 1945, however, the company is lacking commodities for the resumption of production. Only through clever negotiations with the American and French occupation powers can Alois Pöschl junior acquire the necessary raw materials such as raw tobacco, sugar beet molasses and white or rapeseed oil for production. Similarly, parts of the company building were damaged during the bombing attacks, for whose restoration Alois Pöschl junior can, only with great skill, get the building materials which are difficult to obtain. Only gradually do some employees return from the war and production can slowly start again. As a result of the currency reform of 1948 and the previous tobacco tax increase, nobody can afford the consumption of snuff any longer. 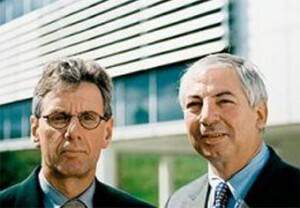 As a consequence, the Pöschl brothers have to cope with corresponding losses in sales. Therefore, Wilhelm and Alois Pöschl develop a strategy for improved product differentiation. They create the trademarks "Doppelaroma" and "Südfrucht" and add, through the Pöschl P in the octagon, a distinctive mark for Pöschl products to the package design: the "sneezing man" belongs henceforth on packs, snuff bottles and in the product appearance in advertising. In order to further boost sales, the brothers strengthen the field service. In order to prevent new crises in the tobacco trade, they create another string to their bow in July 1949 by including smoking tobacco as a new product segment in their range. With the pipe tobacco "Hansa-Krüll" and the fine-cut "Adria" blue and red, Pöschl Tabak shapes the beginning of a smoking-tobacco era in Germany. The strategy of product differentiation and product expansion proves to be successful and not only leads the company out of the crisis, but also brings continuous growth. PÖSCHL BECOMES "GERMAN SMOKING TOBACCO MIRACLE"
In the mid-sixties, a far-reaching trend towards pipe smoking develops. Pipe-smoking, which is cheaper compared to the consumption of cigarettes, initially becomes very popular among students as an inexpensive and intellectual pleasure. But even in the public and in the media, many celebrities acquire a taste for the pipe, so that the demand for pipe tobacco booms alongside the classic fine-cut tobacco. Pöschl reacts to this trend at the right time and introduces the "Exklusiv" pipe tobacco range with the head of the English guardsman to the German market.Simultaneously, Wilhelm Pöschl extends the sales network throughout Germany in a short time. This targeted and rapid response to the trend towards pipes consolidates sales of the smoking tobacco products from the Pöschl Tabak company, while sales of many competitors decrease. With acknowledgement, the competitors of the Pöschl brothers' company therefore call it the "German smoking tobacco miracle". In the early seventies, Wilhelm and Alois Pöschl Junior developed another promising product with the GLETSCHERPRISE Snuff, which comes in addition to the Bavarian Schmalzler classics. Through the combination of refreshing menthol and soft Columbia Oil, the Pöschl brothers cater in particular for the taste of the younger generation. Until now, GLETSCHERPRISE has been classified, with a Germany-wide market share for snuff of around 37% and annual sales of more than 4 million packs, as one of the most successful snuff products made by Pöschl. 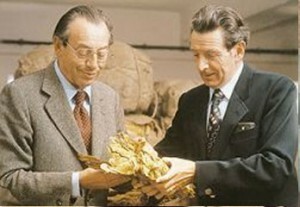 From 1980 onwards, Dr. Ernst Pöschl (son of Wilhelm Pöschl) and Dr. Robert Engels (son-in-law of Alois Pöschl jun.) take over the management of the company. As the third generation of the family, the two Directors focus, in addition to the already widely developed national tobacco market, on building up an international sales network. In doing so, Dr. Engels was responsible for all sales-related questions, association activities and the overall marketing management of the company. The remit of Dr. Pöschl includes strategies for the rationalisation of the work flows and measures for ensuring controlled tobacco quality from the field to the finished product. As a result of joint strategic decisions and the right feeling for new markets, the two Directors were also able to effectively supply the tobacco trade abroad. Besides traditional export countries such as France, Austria, the United Kingdom, Italy, Spain and Switzerland, Pöschl Tabak also has customers from the Czech Republic, Slovakia, Poland, Hungary, Romania, Bulgaria, Belgium, Luxembourg, the Far East and the United States as their customers. As a consequence, a large proportion of the smoking tobacco and snuff production is exported worldwide. Subsidiaries for direct sales have been established in the exporting countries. Pöschl Tabak can now rely on a worldwide sales network and exports to over 100 countries worldwide. In order to meet the continued increase in demand for tobacco products at the beginning of the nineties, the two Directors decide upon the construction of a new manufacturing plant in Geisenhausen near Landshut. These are completed in 1995 and the company moves in. The first two management generations of Pöschl Tabak already put great emphasis on environmentally-friendly production methods in order to protect the resources of nature. This guiding principle is also continued in the construction of the buildings at the new location. A highly modern world of work for production according to the latest environmental standards is created, which copes without human and environmentally hazardous construction materials. Dr. Pöschl and Dr. Engels have since then further improved the current market position of Pöschl Tabak into a leading German, Group-independent producer of snuff and smoking tobacco, as well as the snuff world market leader. The product innovations which Pösch Tabak can boast during this time also deserve special mention: further pipe tobacco ranges such as RADFORD's or GOLDEN BLENDS are added; the RED BULL brand family is developed and consolidated and the additive-free fine-cut PUEBLO is launched on the market. Later on, PUEBLO is also established as a cigarette on the market. In 2006, Business Graduate Patrick Engels joined the Board of Directors as the first member of the fourth generation of the family. His responsibilities include marketing, sales and the logistics of the company. In March 2009 he was appointed Managing Director with power of sole representation of the Pöschl Tobacco Group alongside Dr. Ernst Pöschl and thereby succeeded his father Dr. Robert Engels who passed away in January 2009 after a long, severe illness at the age of only 59 years. 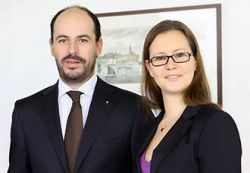 On January 1, 2012, Graduate Industrial Engineer Katharina Pöschl, the daughter of Dr. Ernst Pöschl, entered the business as an Executive Assistant. In February 2014 she took over, as the second representative of the 4th family generation, the areas of Production, Purchasing, Technology and Human Resources from her father.